ThermBright targets are simple to use and require no power. The targets can be ‘hot’ or ‘cold’ and in either polarity. The only preparation required is to slant them backwards ten degrees or more. This is so they can reflect the ‘cold energy of space’. No power/batteries or cables are required. Can be used anywhere without logistic support. ThermBright Thermal Targets can be seen at all times of the day and night. ThermBright Thermal Targets can be seen by all in-service sights including image intensifiers. Tests in the UK showed ThermBright working perfectly at -6 deg C at 3am. Proven in all UK weather conditions as well as countries such as Iraq, Afghanistan and Norway. Will work in full cloud cover. Can easily be patched up and repaired in the field. Observed 2000 hits before significant degradation, compared to 200 hits on conventional thermal targets. ThermBright incorporates shape and thermal identification features. Photo Realistic Targets (PRTT) are available and can be our standard designs or custom made as required. Due to lower capital cost and better durability, ThermBright targets represent significantly better value for money than conventional heated targets. ThermBright targets can be manufactured to meet varying requirements including size, backing material and image. Thermbright products can be manufactured to meet any number of applications. ThermBright is a complete line of thermal targets for live fire training, requiring no external power meaning they can be deployed anywhere. ThermBright manufactures a wide variety of vehicle and infantry targets as well as manufacturing landing, vehicle and personnel ID thermal markers. The ThermBright line of thermal targets provides a diverse set of thermal targets useful in a wide range of battle-training scenarios. As the targets can be used in any weather conditions, day or night, and can be deployed rapidly, their usability is outstanding. Put alongside their lower capital and running costs this means they provide the best choice for military and civilian target practice. The ThermBright material has natural thermal characteristic properties visible in all thermal bands 3-13 microns, and importantly, can be used with image intensifiers (NVG’s) as well as thermal imagers. They are used routinely against Javelin Missiles. The targets can be any size up to a full size Battle Tank. They can be inspected for fall of shot, patched up, repaired, and used again. All ThermBright Targets can be repaired to increase longevity. Patches of various sizes are available from small arms fire to tank shot. 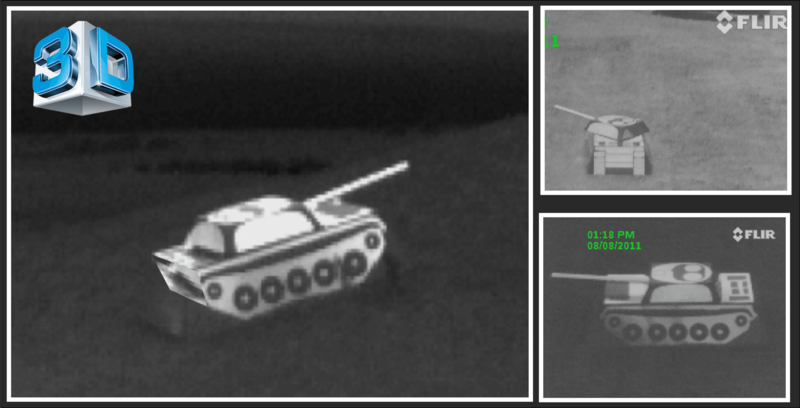 The targets have basic thermal recognition features such as gun, engine, or block. They are not just thermal ‘blobs’ as heated targets tend to be. ThermBright targets last at least 10 times as long as heated targets. User trials concluded that a ThermBright Fig 11 target took over 2000 rounds before degradation, whereas the heated equivalent took only an average of 200 before failure. Many of the targets have NATO Stock Numbers and can be purchased through the NSPA procurement system.